Inspired by a rococo bureau, they painted the original wood finish with water-based enamel paint in white. 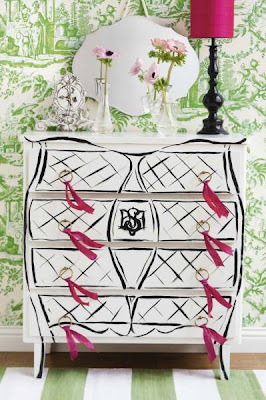 The black details were painted by hand using a fine brush; they said painting free-hand can seem a bit scary, but adds an extra charm. The pink straps are fitted with wire inside so that you can shape them any way you want. (I wish they had a "before" picture!). Before the sconce was painted, masking tape was placed over the flowers and small little dots were also taped off. After a few coats of water-based spray paint in green, the white flowers and random polka dots really pop. After the chairs were painted with a coat of white paint, they painted a design of loops with dots, inspired by the wallpaper behind, across the padded seat and seat back. The bureau is so creative & fun! It would be so wonderful in a teenager's room! I feel inspired to go flea market shopping. Think I should Google and see if there are any here in London, Ontario. In Sydney, my permanent home, flea marketeers (new word?) have made it almost impossible to find treasures - it's big business now. I love treasure hunting at flea markets! That first pic is fabulous- restored perfection! Gorgeously amazing! I have tons of flea market furniture that I've painted, and free-handing some motifs would be a great way to perk them up! 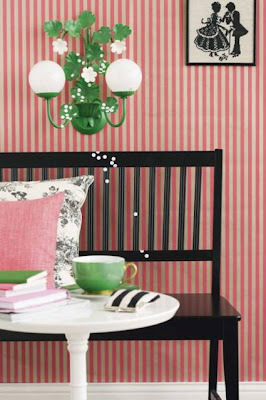 I lurve that wall sconce - so much fun and just gorgeous! I also think the wallpaper in the last two pics is absolutely fab! 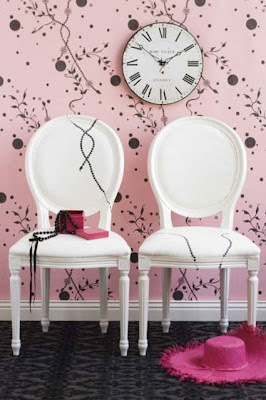 So cute the way the dots on the sconce 'dribble' down onto the black seat, and the beads motif in the last pic's wallpaper is copied on the chairs and in the way the black jewellery is displayed - great pic posing!! Enjoy your blog very much, and always love to read your quotes! WOW, they're all fabulous!! She is so talented! Wonderful ideas, just goes to show what a whole lot of talent and imagination can do in this world. Thank you for this. I'll go have a visit at the site. such cute Ideas!! love them all. how cute is that little ribbon on the hardware! btw Im having a giveaway on my blog if you would like to enter.. So cool! One of my fav past times is to look for inexpensive, good quality furniture at thrift stores and revamp it. This site will be great for some inspiration!